◊ In the fall of 1910, the Toronto newspapers described certain bureaucratic difficulties that had been discovered in the naturalization applications of hundreds of would-be citizens because an assistant of Justice of the Peace Jacob Cohen had been signing the forms for Cohen instead of Cohen signing his own name himself. Cohen apparently had no knowledge that the practice had been taking place, and the naturalization certificates that were thus processed were deemed to be invalid. 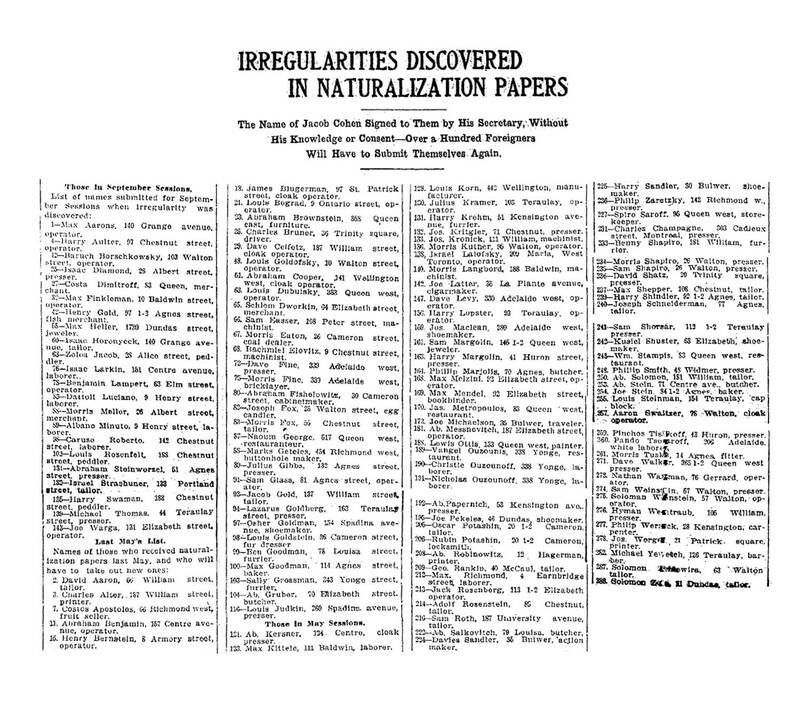 A list of several hundred naturalization candidates appears below — and may prove valuable to genealogists seeking to ascertain whether a father, grandfather or great-grandfather was present in Toronto at that time. Just how long this wholesale irregularity has been going on it is impossible to say, but it seems safe to assume that there are a goodly number of foreigners in Toronto who enjoy the full privileges of citizenship, including the right to vote, who really have no right to them. Mr. Cohen is likely to come in for some criticism for allowing the free use of his name attached to these applications, and for the consequent mix-up that will result next election day. Naturally all these voters will have been carefully looked after by the two parties, and as their names will now have to be stricken off the voters’ lists, considerable trouble will doubtless ensue. It appears that a man named Dworkin, who has a news stand at 64 Elizabeth street, was particularly active in getting together groups of foreigners anxious for naturalization, and it was through his efforts that the longer list of names was compiled and submitted to the Clerk of the Peace. Since then Dworkin has had nothing to do with the work. For naturalization he charged the foreigners either $1.25 or $1, of which turned over 25 cents to the Clerk of the Peace, the regular fee, and the balance he divided with Murray [Jacob Cohen’s confidential clerk]. Lately a lawyer on Chestnut street has been doing most of the naturalization work. When asked by The Star this morning what he had to say with regard to the irregularities in the applications Mr. Cohen claimed that his name was used entirely without his knowledge.